Today marks the first day of week 2, November 8 to 14th. 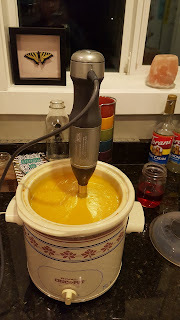 I am so excited, making my first butternut squash soup with a butternut from my garden! It smells great, dinner in in about an hour. I am going to throw some rolls in the oven to have with it, because soups need something dipped in them. I got this recipe from Taste of Home. I got the recipe out of a TOH book, and didn't know the reviews, but it smells good, and the little guy might like a cinnamon soup. Here is a sad picture of it cooking. So here is the Butternut Squash Bisque. 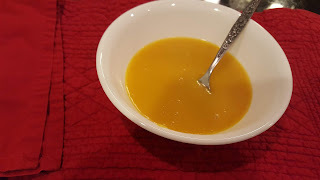 So I pureed the soup. That's what you do with bisque. BUT let me tell you my changes first. I followed the recipe, but honestly, the cooking in OJ in oven is a waste. LEAVE out the OJ and brown sugar. The apples add plenty of sweetness. 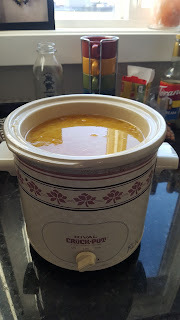 I also added 2 tablespoons of short grain rice to the crock pot after I took the picture above, to thicken it a little, and give it a better mouth feel. I also added half a pint of home canned cannellini beans that I drained and rinsed to add some protein to the soup. THIS SOUP WAS WAY TOO SWEET!!! Trust me, leave out the OJ and brown sugar. Don't bother roasting the squash in the oven first. DO NOT use 1/2 cup butter, it was too much. I doubled this and still only used 1/2 cup butter for the onions and it was too much. 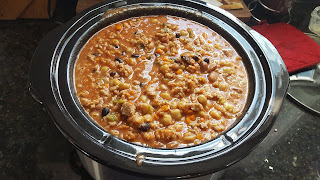 The rice helped with the mouth feel, and the beans kind of toned down the sweetness. I might make this again, with changes. BUT I don't know. The cousin thought it was a warm dessert soup. November 11th: Veterans Day..While in the morning I somberly remembered my Grandfathers, and their brothers who have served. I also remember our Angel girl.. who fought a different war, a war against Medical Discrimination and Gene Discrimination. Although I think of her daily, I was a wreck most of the morning. Today we used our instant pot to "bake" potatoes. Then the piper mashed them and made "his special recipe" for garlic mash. They were delicious! 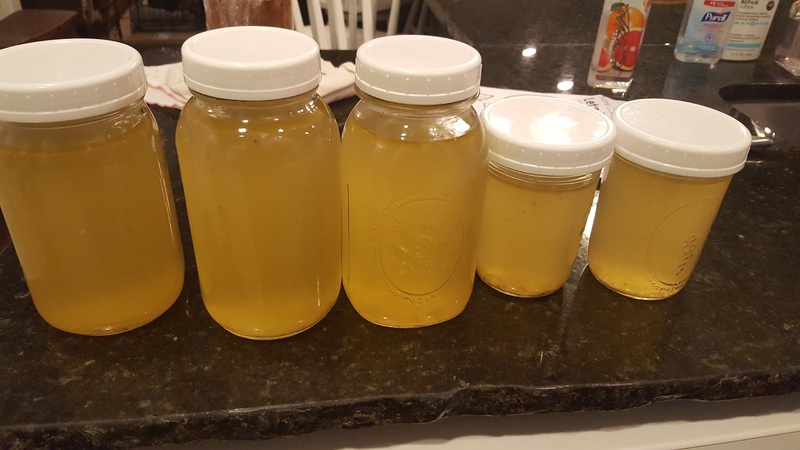 November 12th: BONE BROTH.. 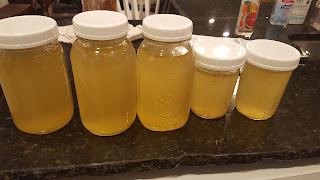 I make bone broth almost weekly, this time I accidently made it with too much water. I am used to having bones from 2 chickens in the pot, not one.. So I messed up. Owell, I just won't have to dilute it before using it. I got 4 quarts total, normally I get 4 quarts from 2 birds. 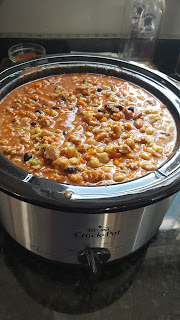 For dinner tonight I pulled some chili from the freezer that I made in the instant pot last month. Threw that and some shredded cheddar in some tortillas and fried them up in butter, DELICIOUS. November 14th: LAST day of week #2, and wow Guess what I did??? I messed up!! I forgot to read both sides of my recipe card.. So I tripled my recipe for Chili but... ok, so I tripled the meat, but I have to multiply everything else by 6 !! WOOPS So ya.. 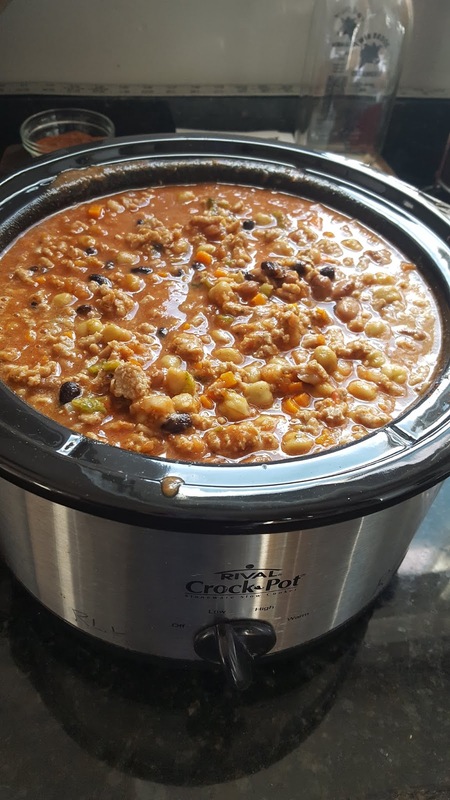 I love this chili recipe. It is so yummy. I got this recipe from my sister, and I doctored it up a little. 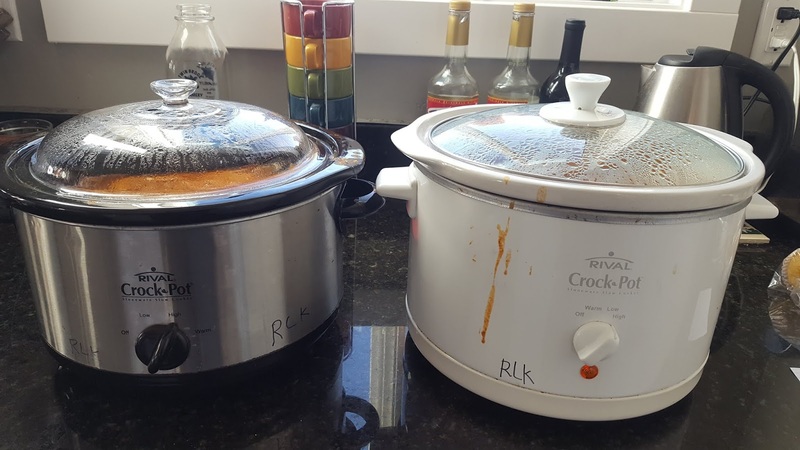 Hands down our families favorite chili, and we eat a lot of chilis. Can you smell this? OMGoodness my mouth is watering.. I almost said my watering mouth.. either way.. let me wipe the drool off my chin. We usually top this yumminess with some shredded cheddar. The little one likes a little sour cream too as he doesn't like spice (except buffalo wings). CROCK POT: Follow directions above until you have warmed spices. While meat is cooking, place beans, tomato sauce, 2 prepared poblanos and broth mix, garlic, oregano if you didn't put in with meat. When meat is done, add to crock pot, give a stir. Cook on HIGH 3 to 4 hours, Low 4 to 6 hours. We also use this chili for making quesadillas: tortillas, chili and cheese. We put chili on half the tortilla, top with cheese, fold empty side over the cheese and fry in butter on each side until golden brown.. My FAVORITE meal growing up.